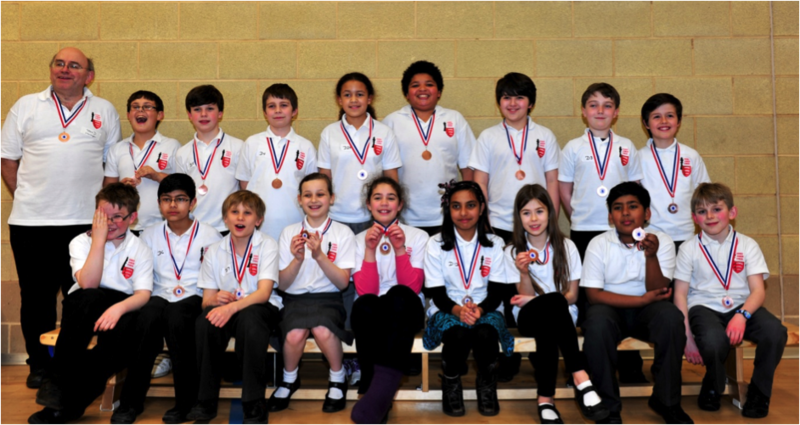 The under 11s played in the EPSCA Zonal at The Malcolm Arnold Academy, Trinity Avenue, Northampton on 16th March 2013. The zonal was expanded this year with nine teams chasing six qualification slots for the finals in May. The teams were Barnet, Birmingham, Cambridge, Essex, Hertfordshire, Kent, Northamptonshire, Richmond and Suffolk. As ever a good performance would be required. Round one was a disappointing start with eight points. Disappointing because, although there were some good wins, several boards seemed to throw away a good position. Most notable games were Elliot’s and Alex A’s titanic struggles with Barnet players – Elliot fell to some excellent defence, but Alex A’s opponent was very lucky to escape with a draw. Still fifth equal with two other teams was worrying, so some encouragement was needed for the next round. It obviously worked - round two was a big improvement, especially by the lower boards. The only sour note was Alex C having an arbiter decision going against him to be left with an immediate loss after what was looking like a possible win earlier in the game – we all learn from these things. Notable wins were Niall’s (v Kent) and Mernan’s (v Barnet). 13 points meant a move forward into third by half a point and a much more comfortable position. The third round saw a further improvement to 15 points and a clear third place. Special mention goes to Toby who had the dubious honour of playing Kent, Barnet B6 and Barnet B5. Getting a draw in the final round against a player graded 30 points higher was reward for a really positive attitude throughout the day. Special congratulations to Aditya and Nihaal who won all their games and to Niall, Joe and Alex A who were unbeaten on the day. Everyone, including reserves, scored something. It was also pleasing to see our five girls realising that they can thrive at this level. Also commiserations to Shane who was too ill to play. Finally, thanks to my board stewards Mrudang and Steve, thanks also to Artur for his wise words and support, and of course to all the other parents. A really enjoyable day for everyone - see you at the final!